PH/ORP/ºC waterproof tester with automatic calibration in 2 points, range -2.00 to 16.00 pH / -5.0 to 60.0 ºC / ± 1000 mV, accuracy of ± 0.01 pH / 1 mV, Automatic Temperature Compensation. Supplied with interchangeable pH electrode Mi58P. Combination waterproof testers with advanced functions also include the new model pH58 for simultaneous pH and ORP measurements and temperature, which is continuously displayed on the dual level LCD. It shows readings in an extended range from -2.00 to 16.00 pH or ±1000 mV and simultaneously shows temperature from -5.0 to 105.0°C or 23 to 221°F. The pH58 has a stability indicator and hold feature that freezes the display for easy and accurate recording. The large display also has graphic symbols to guide you through all operations. Calibration is performed automatically at 1 or 2 points using standard or NIST buffers. The modular design allows easy electrode and battery replacement. 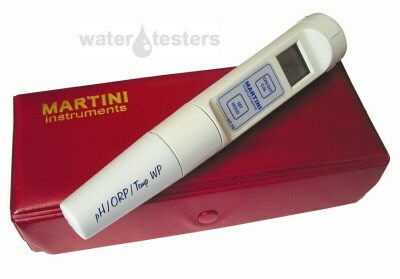 Ideal for aquarium water testing, lab use and hydropnic testing.